Free yoga mat giveaway! (And hot sauce discount.) 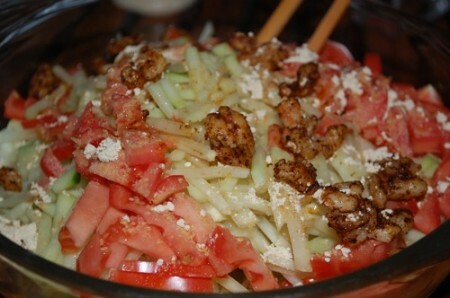 Now: Papaya Salad. 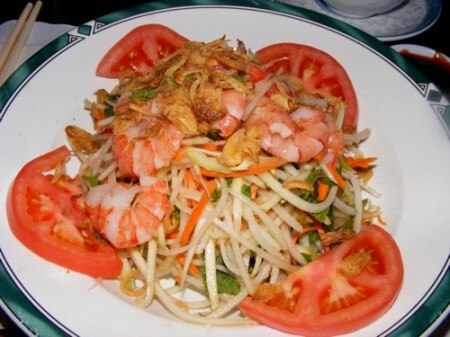 Papaya salad is in both Thai and Vietnamese cuisine. 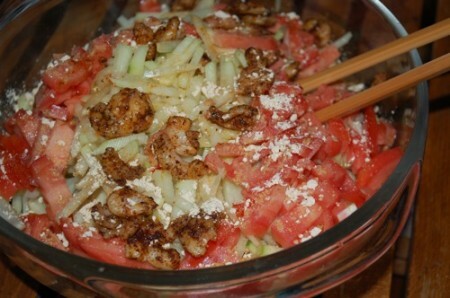 My favoritefavorite is the Vietnamese version of papaya salad, but I suppose this is kind of a mix of both. 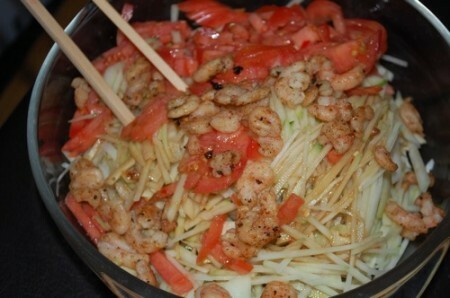 I love papaya salad. So much so that I had it for dinner 2 nights in a row. To slice the papaya into such tiny strips (which is the only way to enjoy green papaya), I first used my mandoline to slice the papaya in thin strips. Then I just cut up the strips. It didn’t take long at all. 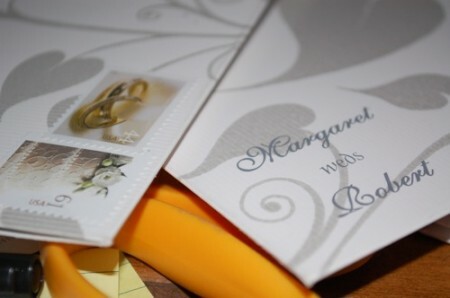 Celebrate finishing my wedding invitations that is! Almost all of them were mailed out today. I know I owe you that explanation for why I suddenly have more time. The truth is, I don’t really have that much more time. I cut back to part time at my job and I am taking a class in the evenings, but the class ends up taking up 4-5 hours of my night… so I have about the same amount of free time as I did before. But I love the class. It’s a linguistics class. Have you ever taken a class after you graduated college? 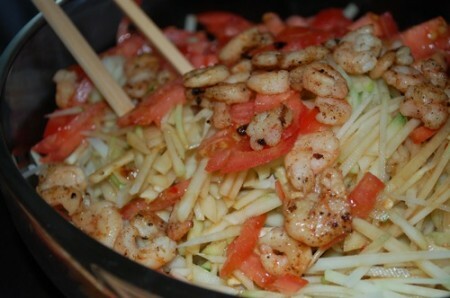 Do you like papaya salad? Two huge things happened this week. One: I finally got over the flu. Two: I have more time to blog again. Maybe daily. And maybe even comment on all of your beautiful blogs. 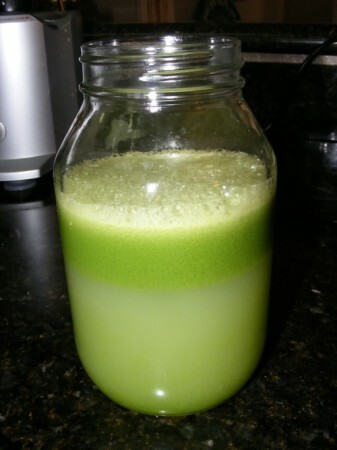 Breakfast was a green juice with lemon and ginger from The Health Nuts. Yes, this juice is $5.99 (a large), but that’s actually cheap when you consider the fact that The Blueprint Cleanse is about $75 per day (6 juices – one of which is simply water, lemon juice, agave, and cayenne pepper). After breakfast I did a killer kickbox workout from Netflix (you can work out when you’re sick as long as the cold is just in your head – this made me feel better). 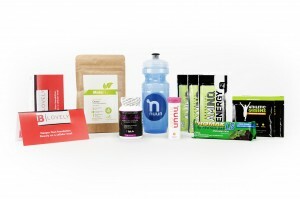 It’s called 10 Minute Solution – Kickbox Bootcamp. The workout was good, but I didn’t like the instructor that much. 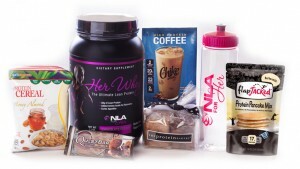 After I did this one I did a few minutes of Crunch: Super Slimdown which I really liked. I’ll definitely finish it tomorrow. It’s a combination of yoga and pilates (so far). This instructor, Ellen Barret, had a gorgeous figure. Lunch was a salad ordered out from Cafe Metro: romaine base, smoked tofu, egg whites, avocado, peppers, broccoli, tomatoes, cucumber, grapes, mandarin orange, mushrooms, onions, roasted peppers, sliced beets, and sprouts. I got it chopped with dressing on the side – Chipotle Ranch. It also came with a whole wheat bun, which I had a little later. 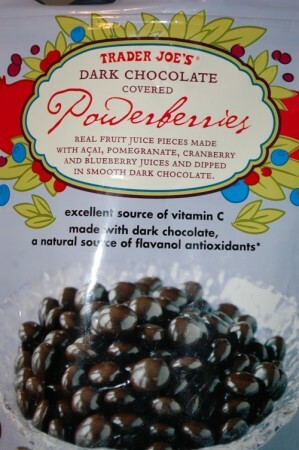 Lunch dessert – these chocolate powerberry things from Trader Joe’s. Just a handful. Or two. For dinner we went out to Thai Son in Chinatown, which is actually Vietnamese. 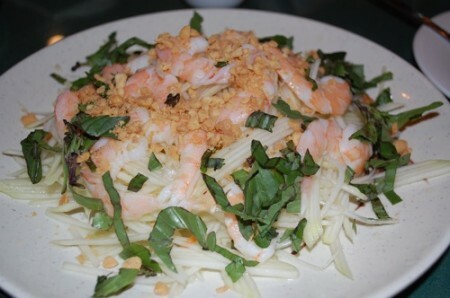 I got the papaya salad – green papaya, shrimp, peanuts, and the Vietnamese dressing with fish sauce. I had some of Bobby’s beef pho as well. 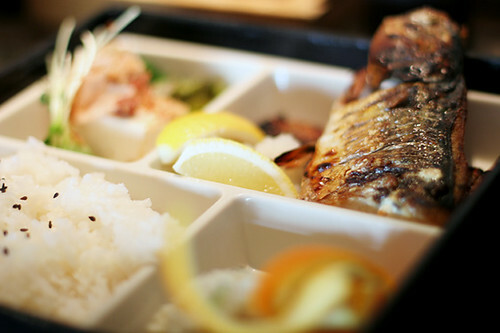 This is my ultimate favorite meal. 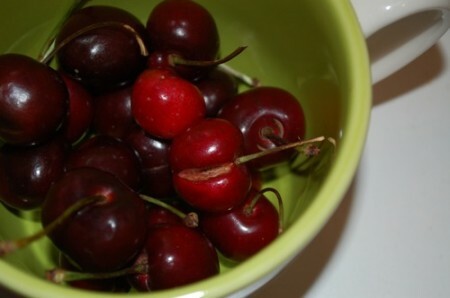 Dessert – Chinatown cherries. Two pounds for $3. Now they are gone. My brother is coming into the city tomorrow to get lunch so that should be fun. I also scheduled a facial now that I’m over the flu. 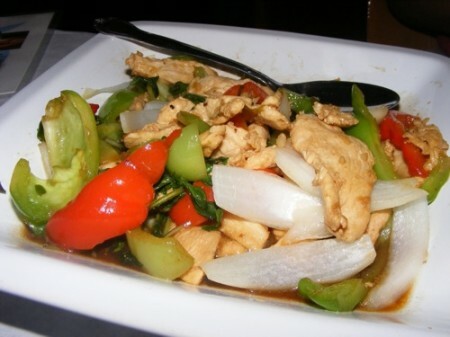 If you had to eat one meal forever, what would it be? Mine would be papaya salad. I don’t even think this would be a hardship for me. We are on day 2 of our Miami trip (we got here Tuesday night; we are in town for Bobby’s sister’s high school graduation). So far eats have been fantastic, but unfortunately I have a cold. I’m recovering, I think! Today has been great so far too. We are headed off now, but I had oatmeal with blueberries, wheat germ, and honey for breakfast (Bobby’s mom had oatmeal too) and then we snacked on papaya. We are having such an amazing time here. It’s so good to be with Bobby’s family (my family now too), who we don’t get to see very often.